The Guardian Life Insurance Company of America® (Guardian) recently granted $400,000 to Dental Lifeline Network (DLN). The grant will help DLN ramp up its volunteer dentist recruitment efforts and staffing to treat individuals who suffer from serious dental issues in Connecticut, Illinois, Pennsylvania, and Virginia in 2019. Take, for example Darrell, a Marine Corp Veteran who served in Vietnam for four years and lives in the Chicago area. He had no dental coverage and developed serious heart issues. 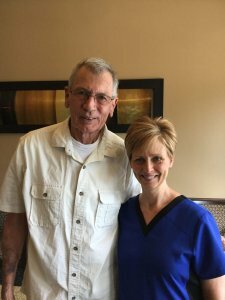 His doctor recommended that he obtain oral health treatment to prevent complications since Darrell had several missing teeth and many that were loose and decayed. This donation comes on the heels of last year’s $125,000 Guardian grant in the state of Washington, which helped begin to relieve the 147 cases backlogged due to insufficient funding. Since receiving the grant, DLN increased its staffing and has provided comprehensive dental care to Washington’s most vulnerable residents. “Everyone deserves a Guardian” is at the heart of the company’s philanthropic efforts, which is why the grant will focus on leveraging DLN’s Will You See One campaign and help recruit volunteer dentists. Launched in 2017, the campaign targets dentists with the powerful message that volunteer dentists have the capacity to not only provide donated dental care but to change lives within their community—sometimes in a life-saving way. Last year, DLN took the campaign to the next level by focusing on Will You See One Vet, encouraging dentists to support and honor our veterans in need of comprehensive dental care. Through the DDS program, DLN provides comprehensive dental care through a national network of 15,000 volunteer dentists and 3,700 volunteer laboratories. Support DLN at 2019 Midwinter on Every Smile Counts Day!